Daughter of Mythos provides a good, tasty meat & potatoes secret-destiny/portal fiction story with a nice twist near the end. The main character is relatable and sympathetic, the supporting cast provide plenty of intrigue, support and challenges, and the fantasy elements are introduced with just enough exposition to make the history feel real and the internal logic reasonable. I often wait a bit before I review a book. I like to give the newness a little time to settle, to allow my impressions to solidify or change, and most of all to see if something that bugs me keeps bugging me after the specifics blur. I read this back in the autumn of 2014, but I needed to re-read it before reviewing because I didn’t recall the details well enough to discuss them knowledgeably. That is as much a strength as a weakness. I read a LOT of fantasy, so much that the irritants are usually what stay with me. I wanted to make sure I hadn’t forgotten anything bad about this book, and I hadn’t. The second read was as enjoyable as the first. 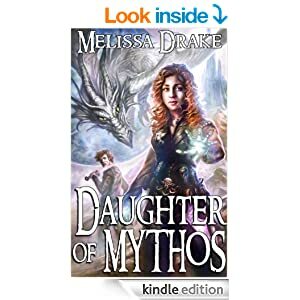 Daughter of Mythos aims to be a really fun curl-up-with-a-good-read adventure story, and it hits that spot just right. It isn’t groundbreaking, it isn’t life-changing, it doesn’t use lots of new spices or herbs or throw any exotic flavors at me. (figuratively speaking) It fulfills all its promises and more. It satisfied my craving for characters who face trials and make hard choices, it gave me a fun fantasy ride and an interesting world to visit. In a word, it was tasty. ← What Kind of Writing is Right?